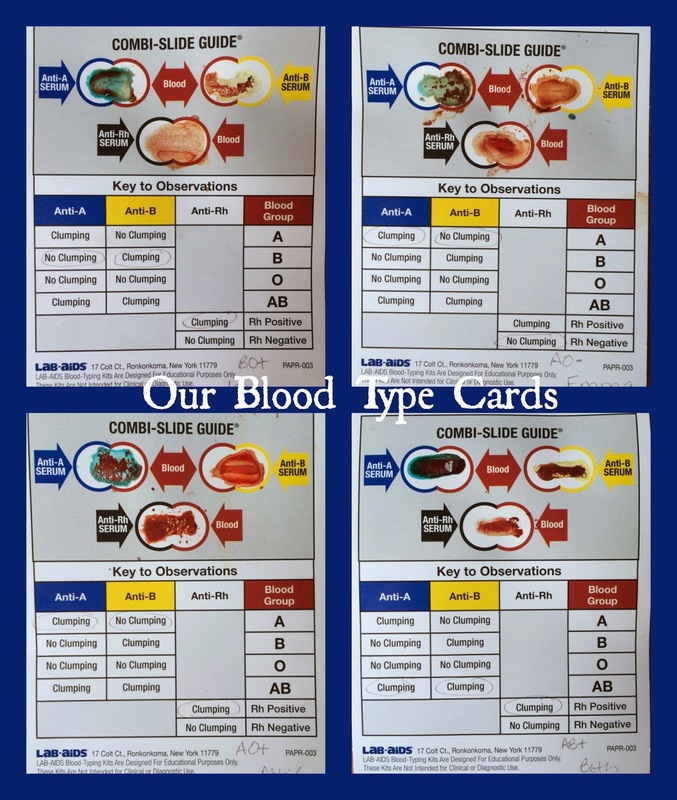 Acorn Hill Academy: What's Your Blood Type? 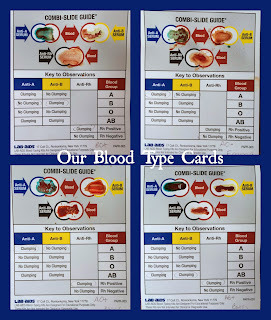 Do you know what your blood type is? I know mine, because it was written on the little cards on the bassinets at the hospital when my babies were born. Actually, I wasn't sure if it was my blood type or theirs, but it turns out to have been mine: AB+. I asked my husband, and said he's pretty sure his blood type is O-. At our last co-op meeting for 2013, my friend Sara, had us all test our blood types for nature study. She got some kits, which included cards, anti-A serum, anti-B serum, and anti-Rh serum, along with color-coded toothpick stirrers and needles to poke our fingers. The needles were pretty big, so she very kindly allowed us to use the finger-poker they use with their diabetic son. After poking my finger, I put a drop of blood in each of three spots on my card, then added the appropriate serum and mixed them. After a few minutes, I could see where my blood was beginning to clot and where it was not. My blood clotted with both the anti-A serum and the anti-B serum, but not the anti-Rh serum, so I knew I had both the A protein and the B protein, and my Rh was positive. When Sara's boys were tested, they were surprised by some of the results. Sara and her husband both testsed Rh negative, but a couple of the boys tested Rh positive. A bit of quick research showed that you can have one positive Rh allele and on negative. Genetics are never as simple as they seem, are they? I learned that while Todd is a "universal donor," meaning his blood type can be donated to anyone as long as they are Rh-. I, on the other hand, am a "universal recipient," meaning I can receive blood from anyone, but I can't donate to anyone unless they have my specific blood type.